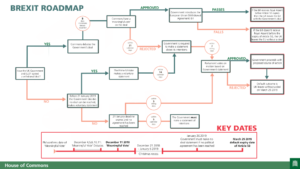 After months of negotiations, last month the UK and European Union came to an agreement on the Withdrawal Agreement and Political Declaration, which outlines the future relationship framework between the UK and EU. At an emergency EU Summit held in November, the Withdrawal Agreement and Political Declaration were ratified by the EU27, but now they need to be approved by the UK’s Parliament before they can take effect. Currently MPs in the House of Commons are debating the Withdrawal Agreement in full. Following this on Tuesday 11 December, a “meaningful vote” will take place on the Withdrawal Agreement and Political Declaration. The “meaningful vote” Parliamentarians have, was made under Section 13(1) of the European Union (Withdrawal) Act 2018, which requires the draft deal to be put to both the House of Commons and House of Lords. If the vote passes in the House of Commons, it is likely to pass through the House of Lords with no problems. Following this the Government will introduce the European Union (Withdrawal Agreement) Bill, the Bill will then need to receive Royal Assent before the Article 50 period expires and then the UK will leave the EU with the Government’s deal. 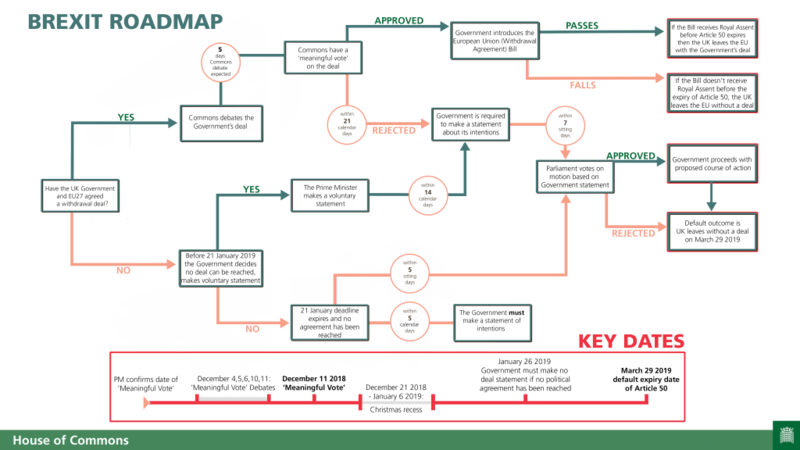 However if MPs do not vote for the Withdrawal Agreement and Political declaration and the government loses the vote, there are a number of scenarios that could play out. 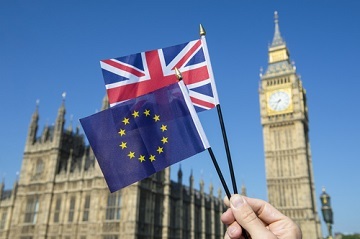 In the first instance, it is likely that the Government will hold a second vote in quick succession, hoping that the threat of a no deal Brexit and market turmoil will pressure MPs to vote for the Government’s deal. In the margins of this, the Labour Party as the opposition Party will be making a noise about a General Election and Second Referendum, but at this stage it is unlikely either of these options will play out. If the second vote results in no majority the Government is required to make a statement about its intention within 21 calendar days. Within 7 sitting days of this statement, Parliament will vote again on a motion based on the Government Statement. The significance of this, is that following an amendment passed on Tuesday 4 December by Dominic Grieve MP, MPs will have a say on what happens next if the Prime Minister’s Brexit deal is rejected. The outcome of this amendment passing makes the prospect of a No Deal Brexit less likely, but still a possibility. It also gives Parliament more power to scrutinise the Government in the next steps if they lose the meaningful vote. ADS will be monitoring progress and will be updating our Brexit Hub, Newsroom and Twitter with further information as we receive it.